Join the Loki world today! The first thing our Viking found when he entered Loki Casino was the signup button flashing at him. Enticing him to take advantage of the welcome pack and bonuses Loki had to offer. Before doing so our Viking closely read the terms and conditions to make sure he agreed with them before playing. After having a good look around he found no sign of Loki so he decided to play. What a fine selection of games there is as well. After playing late into the night he found the bright white of the websites background a distraction. As luck had it there is an option to change this to a less glaring black. With that lets jump in and find out what the Viking thought about the games and bonuses. So what does Loki Casino have to offer? He found the welcome pack pleasing with 1200 EUR and 100 free spins. He found other promotions as well including 100%, 75% and 50% bonuses on first, second and third deposits. Furthermore, there is a loyalty scheme that offers cashback points which can be turned into real money. Making deposits will earn you cashback points. So make sure to check out the promotion page if Loki Casino interests you. Our Viking reported to us that you can sign up with many different currencies including Bitcoin, Visa, and Skrill. Although he did mention that all the bonuses and payment methods come with terms and conditions like having to wage a multiple of your bonus before cashing it out and even fees on some payment methods. Although this is standard practice throughout online casinos its something the Viking did not like. To the fun stuff – Games. “A fine selection on offer” was the first words out of the Viking’s mouth. With well over 300 games at the time of his playing, there is something to suit everyone. The categories for the games can all appear on the home page and can be nicely sorted by clicking on the New, Slots, Jackpots, Live Casino, Table Games, and others options. This helped the Viking find his old favorites and make some new ones. The games themselves are from some of the biggest developers like Netent and YGGDRASIL to name but two. If you are feeling brave enough you can even try Loki’s picks. If you want to try these recommendations for yourself you will find the option at the bottom of the page. To sail to Loki’s or not? 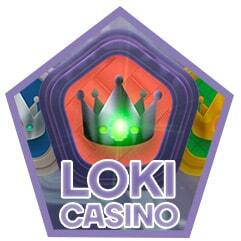 Our Viking found Loki Casino to his liking with its many games and supporting languages. You can change this using the flags at the bottom of the screen or the drop-down menu in the top right. Our Viking had no trouble with the load times of the games or website and found it easy to navigate. When looking for help the Viking found there were three main options, 24/7 live chat and contact form for complicated issues and an FAQ section for more basic problems. All this combined makes Loki Casino a great place of pleasure and if you would like to check it out. Just click the link above and sail there yourself.